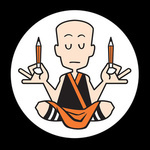 Zen Pencils: “Shaolin Monk Experience” – Nerdwatch! He produces his comic twice weekly, and though his style is very basic, it lets him display aspects of each quote in real or fanciful situations, depending on his interpretation of the original speaker’s intent, without distracting from the content of the quote. He’s done comics based on quotes from people as diverse as Albert Einstein, Jesse Owens, Rudyard Kipling, Calvin Coolidge, and the Dalai Lama, to name a few. His choice of illustrations can sometimes be quirky, and I don’t always agree with the speakers he chooses, but his desire to create meaningful images, to tell an appropriate story for the quote in pictures, that is unmistakable, and I can’t help but respect and admire that. He makes some of his works available as free posters, but he also sells them as prints. He has a mascot, a Shaolin Monk, who he uses occasionally in quotes, currently in his free posters of quotes from Ralph Waldo Emerson. According to his blog, he recently received a gift, an animation of one of his illustrations, with musical accompaniment, from a studio called LIMsomnium. The studio created the partially interactive animation based on one of Mr. Than’s Shaolin Monk comics. LIMsomnium created a very exciting soundtrack to go with the animation, which you can download if you click on the link in the closing credits. One caution: the animation doesn’t work well in Internet Explorer on Windows, nor in Camino on the Mac, so if you’re on a Mac or iPad/iPod/iPhone with Safari you’re okay, or possibly if you use Firefox or Chrome on Windows, although I haven’t tested those. Once the animation starts, move your cursor over the pictures and they’ll have some inner animation. As always, I strongly suggest browsing the archives, although unlike other webcomics I’ve reviewed, this is not a sequential story and the entries can be read at random. There are a few quotes from people like George Carlin that can be offensive to people who don’t like certain language, but nearly all the rest are fine for kids, and safe for work. Experience his art, and even if you’re like me and don’t agree with all of the quotes, I think we can all enjoy his enthusiasm and the joy he takes in his creations. Tagged cartoons, philosophy, quotes, Shaolin Monk, Zen. Bookmark the permalink.